Sam Reide (Chris Camack) has the ability to travel back in time. He uses this gift to aid police in unsolved crimes by witnessing directly the perpetrators in the act, disguising his abilities as a psychic. He lives with his dysfunctional and emotionally damaged sister Jenna (Rachel Miner) who helps him with the time travel ritual, having been saved by her brother from a fire as a child which killed both their parents. Sam is also a tortured soul having lost his girlfriend years ago to a vicious murder. He vainly attempts to solve his personal tragedy through time travel that brings unforeseen changes to his current situation for himself and those close to him. Sam is visited by his dead girlfriend’s sister Elizabeth, who convinces him that the man convicted of her murder is innocent. Trying to right wrongs and to satisfy his own need for closure he travels back to witness her final moments, unfortunately his time meddling leaves both his girlfriend and Elizabeth dead. When he returns to the present he finds he and his sister’s roles reversed, he being the deadbeat obsessed with the murder case. Also it seems he has unleashed a serial killer who continues to this day mutilating brunette women who bear a resemblance to Sam’s girlfriend nicknamed the “Pontiac Killer”. Sam seeks advice from his friend Goldberg who seems to sage him in the rules of time travel but when he too goes missing Sam becomes the prime suspect in the Pontiac slayings. Jenna tries to warn him that he may be the killer and to stop time travelling but his desire to seek the truth is too great. This leads him to travel back to an abandoned Detroit factory; he finds Goldberg bloody but still alive but is disabled by a bear trap. Sam is now trapped and confronted by the serial killer. To his shock and despair it is his own sister Jenna, she declares her own incestuous love for him and confesses her ability to time travel and kill those who were potential love interests or threats to Sam. Sam time jumps away from his sister to when he saved her from the house fire, only this time he traps her in her room to die. He awakes into the present to find he has married Elizabeth and has a daughter named Jenna (after his now dead sister). Arriving at a family barbeque he is welcomed by Goldberg and his parents, young Jenna puts her Barbie doll on the flames of the grill smiling in an unsettling way as the doll burns and melts. Having seen and liked the first Butterfly Effect film, my hopes for another delving into chaos theory with this the third installment did not disappoint. The story flowed along and it kept to the one major plotline which made it easier to follow and stay focused on the main characters of Sam and Jenna. The ritual of time travel with ice, a bathtub and a string attached to a light switch asked more questions than it answered but with a healthy suspension of disbelief I maintained an interest to the end of our tragic hero Sam. Memorable quotes include from Jenna “they were not ladies” justifying her torture of them, and Sam’s “are you MC Hammer” to a policeman who sets him free believing him to be able to time travel as Sam knew this to be the first line the detective’s wife said to him. Reviewing a preproduction Bluray disc picture quality is terrific, clean and crisp as to be expected. It is shot in 16X9 widescreen aspect ratio and has Dolby Digital 5.1 surround sound and an impressive DTS HD-Master Audio option. Running time is approximately 130 minutes. As this is a preproduction disc only English subtitles were found, await the full release to check out any extras. The main menu intro song “Rewind” deserves a mention as being a great mood setter for the movie, if you like emo rock. A solid thriller/horror, time travel is always a paradox but the film concentrates on Sam and Jenna’s relationship and how obsession can lead to tragedy. Not as fresh or original as the first Butterfly Effect it still explores interesting alternate timelines and offers good entertainment. 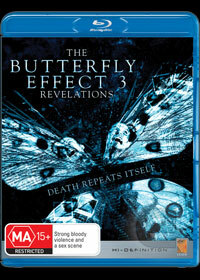 Bluray makes every movie better in some way and The Butterfly Effect (Revelations) benefits from this technology. If you liked the first you will find something to like in this, still interesting and at times disturbing.